One of the most important tasks pool owners need to do is to get their pools ready for winter. The small amount of time and money you invest in winterizing your swimming pool is crucial for preventing possible damage that winter is notorious for causing. Here are some simple steps for preparing your in-ground pool for those winter months if you want to tackle this job or have professionals do it for you. A lot of instructions tend to miss (or ignore) this first step. Do yourself a favor and complete this step if you plan to keep your water in the pool over the winter. Start by giving the walls and pool floor a good brushing to knock off any debris or scum that may be hanging around. Removing this stuff now will be a big help in keeping the water clear over the next few months. Then, give the pool a good backwash. The cleaner the water is now, the easier it will be to keep it that way when winter comes. Also, you may want to add a winter-chemical kit to the water. Follow instructions. Now is the time to remove your pool and deck equipment. Storing these items, including ladders, rails, and safety gear, now, will extend their life and make it a snap finding it all next year. Now you can clean the skimmers, filter, and pump basket. Take out any unused chlorine tablets from the chlorinator. Also, now is the time to clean and store cartridge filter elements and D.E. grids. Because water freezes, it is necessary to lower the level of the water below the skimmer openings and jets. This will allow you to drain the rest of the plumbing out of the lines. Once you have the water level correct, you need to get the water out of the lines. This can be done with a shop vac, using the discharge side of the machine to blow the water out of the lines that come from the filter. As the water is removed from each line, use a plug (if needed) to keep water from coming back into the system. Most systems come with these plugs, and you should use what came with your filter system. Tips: Cap off the pool return lines by using threaded plugs, or you can also use expandable rubber plugs if the pool return lines are not threaded. It is important that you remove all drain plugs as these can cause big problems if left in and any remaining water freezes. Remove plugs from the filter pump, filter tank, and other equipment. Tip: Keep all your drain plugs in the pump basket so you know where they are next year. Cover the pool. Consider a safety cover if you have pets or children that may try to walk over the pool. To avoid damage to the cover, do not use bricks or concrete blocks to hold it in place. Some pool owners discount the importance of having a cover pump in place. These little pumps remove water that accumulates during the winter from rain and melting snow. Keep in mind that without one of these inexpensive pumps, your cover may slide into the pool itself, and that makes for one big mess. If you do not have a cover pump, consider getting one and placing it on the cover. If you do not have the time to do this work yourself, contact a local pool supply store to see if they offer a winterizing service. Again, the few dollars you spend on this service will be a good investment in protecting your pool from possible damage. By following the above steps, you will protect your pool from the hazards that come during the winter months. It is much less expensive to prepare your pool now than it is to pay for repairs next year and go through the frustration of a delayed opening. As a homeowner you want your swimming pool to look inviting and invigorating at all times. By using the above tips you can ensure that your swimming pool has a long life, providing you and your family with years of enjoyment. 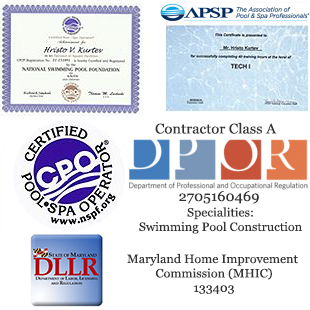 If you don’t have the time or desire to maintain your pool you can contact us and we will do that for you. Please do not hesitate to give us a call for a free estimate! We serve Alexandria VA, Annadale VA, Arlington VA, Burke VA, Chantilly VA, Fairfax VA, Fairfax Station VA, Falls Church VA, Great Falls VA, Leesburg VA, Manassas VA, Mantua VA, McLean VA, Merrifield VA, Oakton VA, Purcellville VA, Reston VA, Tysons Corner VA, Vienna VA, Potomac MD, Chevy Chase MD, Bethesda MD, Rockville MD, Upper Marlboro MD, Fort Washington MD, College Park MD, Clinton MD, Bowie MD, Washington DC Metro area.